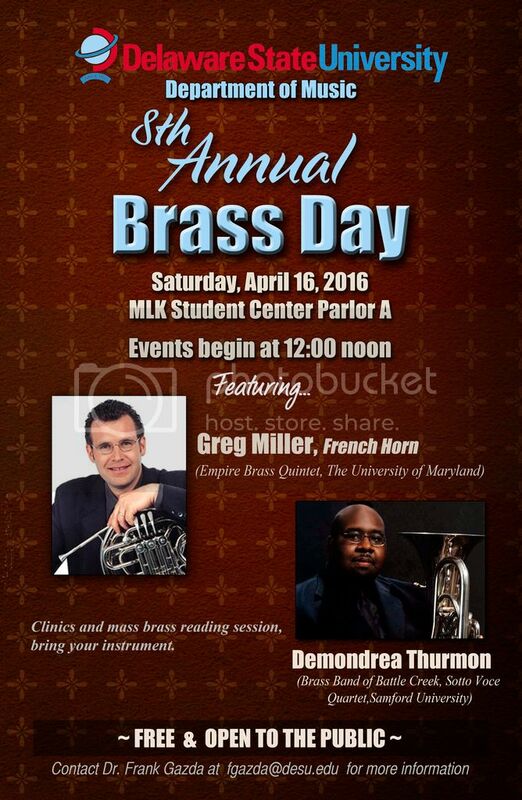 The Delaware State University Department of Music is proud to present our 8th annual Brass Day on Saturday, April 16, 2016. Events begin at 12:00 Noon in Parlor A of the MLK Student Center, and are free and open to the public. Featured guests are French horn player Gregory Miller of the Empire Brass Quintet and the University of Maryland, and Euphonium/Trombonist Demondrea Thurmon of the Brass Band of Battle Creek, the Sotto Voce Tuba Quartet, and Samford University. Join us for an afternoon of concerts, clinics, and masterclasses. Back by popular request is the mass brass reading session, so bring your instrument! Contact Dr. Frank Gazda at fgazda@desu.edu" target="_blank for more information. Please note the change of venue this year to the Martin Luther King Student Center, parlor A.